Stone Age Design, LLC, was founded in 2001 by Chad P. Sanborn. Through the love of his art and with over 25 years of experience in the stone masonry trade, Chad has had the opportunity to work on many diverse stone masonry projects. Whether it is a small outdoor barbecue or an 18,000 square foot fieldstone home, every project is important. 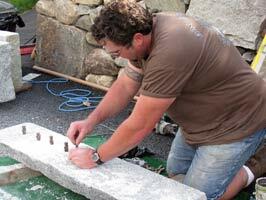 Chad Sanborn demonstrating how to split granite with feathers & wedges at the Gilford Heritage Arts Festival. Since founding Stone Age Design, LLC, under Chad's skillful guidance, we have completed numerous projects, all with complete customer satisfaction. No attention to detail is overlooked. 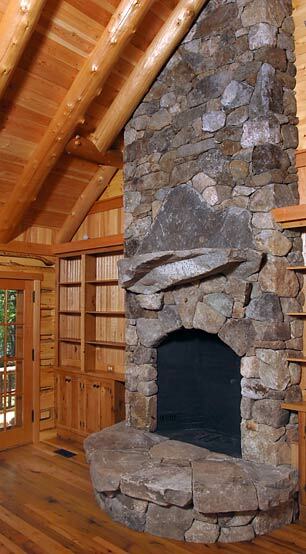 Stone Age Design, LLC has worked closely with architects, building contractors and private home owners, and we take great pride in our workmanship, artistic ability, and the superior reputation to a quality product we have built over the years. Our intent is to work with you to help you achieve your artistic goal. Thanks for the great work. Your work and efforts helped us out to allow for the completion of this project. I sincerely hope we have the opportunity to work on another project. Your vision & talent with stone have transformed our Oak Landing property into something really special. Woody and I love all the projects you completed, but this last one - The Walls - is our all-time favorite. You succeeded in tying all the buildings together, & the result is spectacular. A casual observer would think it was all part of our original plan. Who knew? Only you! A big thank-you to you & Duane for all of your hard work. We hope you & your families enjoy a wonderful holiday season. Come over as quickly as you can to see this gorgeous thing you and the boys have created. It has taken on a life of its own now and turned itself into a fine piece of furniture supported by the strength of this beautiful stone. The combination of tree and rock has settled itself beautifully on top of this little hill, as it if belonged here. Wanted to tell you . . . every morning I open the door and see the wonderful masterpiece you created! You are a true artist and I am so very pleased with the creation. It adds to the pleasure I have in my home. May you and Laurie & children have a very Merry Christmas and a Healthy Happy New Year. Thank you, it was a pleasure working with you!